Seafaring service members may soon be able to transition to the U.S. Merchant Marine with less hassle and at less cost than currently required under an executive order signed Monday by President Donald Trump. The order is designed to bolster the ranks of the Merchant Marine and increase job opportunities for transitioning troops. Noting that a robust civilian fleet is critical to national security, Trump said the new effort will allow the U.S. to retain its "ability to project and sustain forces globally" while helping service members pursue credentials for high-paying jobs. Under the order, the Departments of Defense and Homeland Security will, over the next year, identify all military training and experience that may meet merchant mariner credentialing qualifications and requirements. The Coast Guard National Maritime Center will be required to waive all credentialing fees, as well as the cost of Transportation Worker Identification Credentials, for transitioning active-duty service members who qualify. The goal is to ensure that troops interested in pursuing the merchant mariner career path would receive their certifications or verifications of sea service no later than one month after they leave the military, allowing them to transition straight into new jobs. According to Peter Navarro, the White House director of trade and industrial policy, fees for licensing and mariner credentials can cost as much as $25,000 to obtain. The administration hopes that by waiving the fees and encouraging former service members to serve in the civilian marine sector, the nation can boost the number of merchant mariners who have unlimited ocean-going credentials. Currently, about 12,000 people serve in those jobs. Members of the Merchant Marines can be called up for service by the Navy. They serve on civilian and federally owned merchant ships, supporting trade and military sealift operations. According to Navarro, U.S. water transportation workers earn on average $65,700 a year, with many merchant mariners taking home more than that. 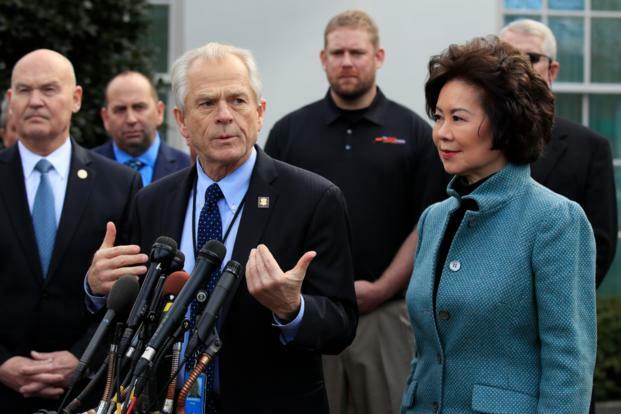 "So this is a great opportunity for sea veterans to seamlessly transition into really good, high-paying jobs that will help our national security front," Navarro said during a phone call with reporters Monday. The U.S. Coast Guard is responsible for credentialing civilian mariners. It already oversees a program called Military to Mariner, which is designed to help service members use their time in service as credit toward becoming credentialed to serve on merchant ships. Navarro said the new program would work closely with that program and with the Coast Guard National Maritime Center credential system. He added that the program will be available to veterans, although he did not provide details for how former service members would apply. In the order, Trump said the program is necessary because the shortage of qualified merchant mariners is a danger to national security. "As our strategic competitors expand their global footprint, the U.S. must retain its ability to project and sustain forces globally," he wrote. "This capability requires a sufficient corps of credentialed merchant mariners available to crew the necessary sealift fleet."